It's crazy we're already halfway through September! 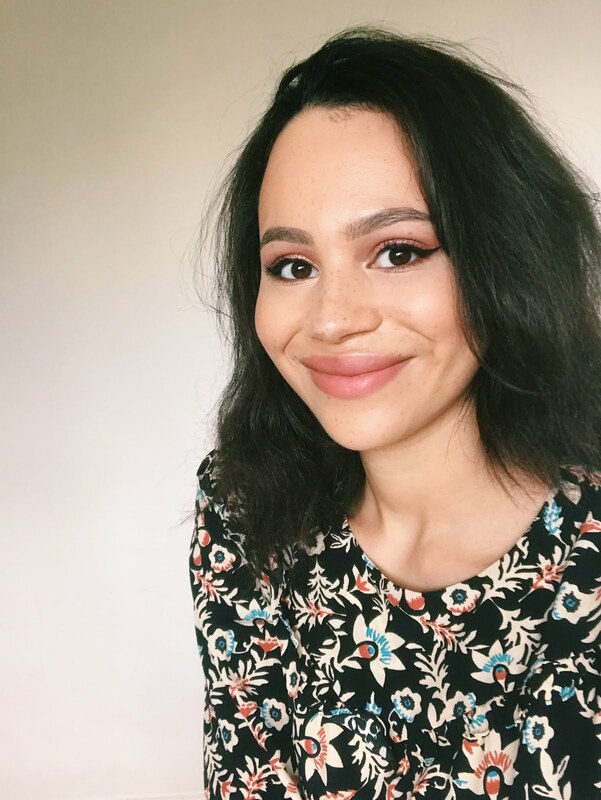 I haven't been wearing that much makeup this month as I've had some time out before starting my new job, but when I have these were the products I wore (Note: I've linked to the full reviews where you can see any swatches). There's only been one foundation for me these past couple of weeks and that has been this new release from Charlotte Tilbury. Shade 7 is pretty much spot on for me and the demi-matte finish is perfect for my combination skin. It has such a build-able coverage so it can have a natural medium coverage or be built to full. I love how even when I go for the natural look with this, it does an amazing job at evening out my skin tone. I don't think it's de-throned my Nars Sheer Glow but it's nice to have a second foundation to switch between. This is my secret weapon against dark circles as you only need the tiniest amount to cancel out the blue tones. I have the shade Dark Peach but it comes in a really wide selection of colours. This stops me having to cake on a heavy flesh-toned concealer under the eyes. I've been reaching for this more than my beloved Nars lately - I don't know what's come over me! I have the shade Warm Medium-Dark, which is a pretty good match for me but I might pick up a second shade in the next lighter colour for under the eyes so it's a little more highlighting. Anyway, this is my favourite 'does it all' concealer because unless I'm seriously suffering with my skin, it's enough to cover most blemishes but it's also light and hydrating enough for under the eyes. I just love the fluffy, easy-to-blend texture of this. I've temporarily put away my Bourjois powder in favour of this lovely offering from MAC. It's really unusual as it's a sort of baked formula with a bit of a sheen to it. I have the shade Medium-Dark, which is pretty perfect for me (I wear NC40 in SFF). It reduces shine whilst being virtually undetectable on the skin so it doesn't matter how quickly you re-apply during the day, it will never look cake-y or dry. My beauty prayers have been answered: Filmstar Bronze and Glow now comes in a deeper shade so I finally decided to pick this up and oh my goodness, I love it! The powders are quite pigmented but you can apply them lightly for a nice, natural dewy glow or build them up to look more dramatic. 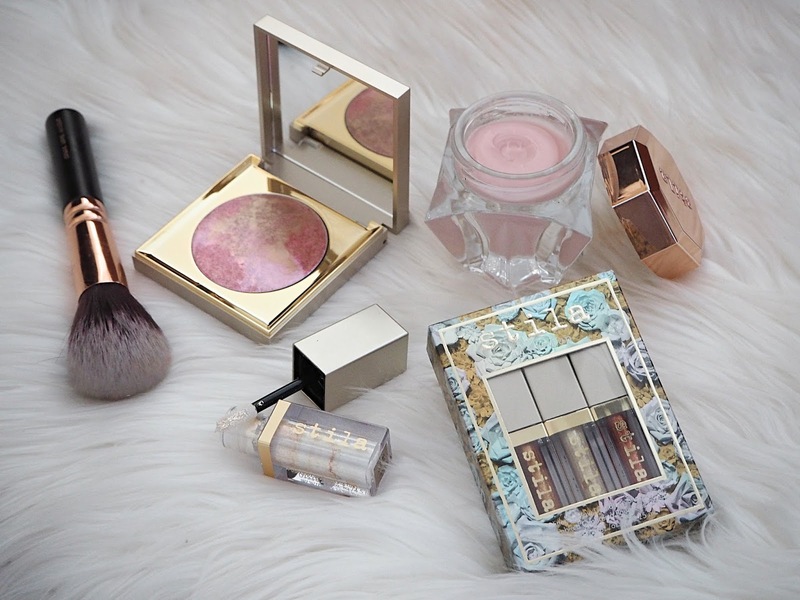 The highlight is beautiful and the sculpt powder is in that perfect place between a really warm shimmery bronzer and a very cool-toned contour powder. To apply Filmstar Bronze and Glow I've been loving these two brushes from Sigma (a full review is on the way). If you want a bronze/contour and highlight brush duo then these are well worth the investment. I use the Tapered Highlight for the Highlight shade, of course, before going in with the Sculpt shade on the Tapered Face brush. What's great about them is that they pick up the perfect amount of product and apply it so evenly. Although they have the tapered ends for precision, the bristles are also really movable for circular motions. They also kept their shape perfectly and looked as good as new after washing. Very uninspired for me, I know, as this is my Holy Grail blusher but it's the one I've been reaching for. I won't bore you too much as I talk about this all the time but for me it's the most beautiful shade in the best formula going. It applies beautifully, has more colour payoff than you'd think and lasts really well throughout the day. I love the mauve-plum tone and the 'lit from within' look it gives is truly unique. My go-to eye look has been using this fantastic palette from Zoeva. It's such great quality and amazing value for money, so I definitely recommend getting your hands on it. I start by using Bitter Start (your standard off-white matte) across the lid as a base before taking the medium caramel-brown matte, Substitute for Love, through the crease. I then I take Pure Ganache, a light gold shimmer, on the inner part of my eyelid. Next I blend that out into Subtle Blend (a deeper bronze shimmer) and finish with a little bit of Warm Notes (a deep pink shimmer) in the crease. It's the perfect way to introduce a bit of colour into your eye look. I was loving this last month and the love has continued into September. The formula of this cream shadow stick is excellent, so I wouldn't mind picking up another shade. Copper is a beautiful shade that goes on like a dewy liquid gold-copper; perfect for an inner-corner highlight. A little predictable for me, I know, but if it ain't broke... This is my favourite eyeliner pen as it's inky black, the perfect shape and size, doesn't transfer and doesn't dry out after about two weeks. And I just can't be without my winged liner! Since I picked up a couple of these Urban Decay liners, I've pretty much been wearing one colour or another from them, depending on my eyeshadow. I love this golden-bronze shimmer for a warm neutral eye look on the lower waterline as I prefer something less harsh than wearing black right the way round my eyes. I got my hands on this on my flight home from holiday so it was considerably cheaper than the usual retail price (more around £13) but I still wanted to get the most out of it so I've been using it pretty much exclusively. 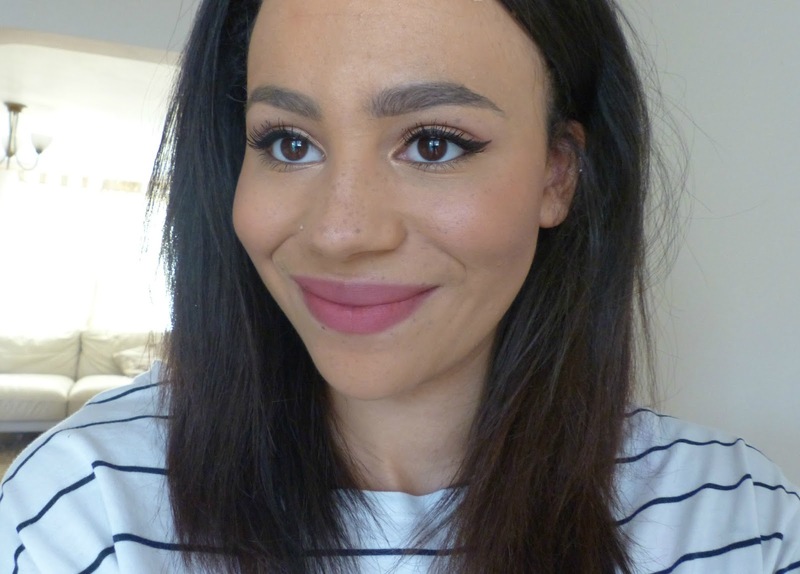 Whilst it's not really a volumising mascara, I'm all about length, curl and definition for my everyday look and this really does it for me in that respect. I won't go on too much about this as I think this has been in just about every monthly makeup post I've ever done! I love the fact that the pencil twists up and it's the perfect texture to get a really natural look. Whilst it only comes in two shades, luckily Hot Chocolate is perfect for me (not too warm, not too grey). The spooly it comes with is also really good and I like having them both on the same product. I finally jumped on the bandwagon and I'm so glad I did because this matte formula is beyond amazing! 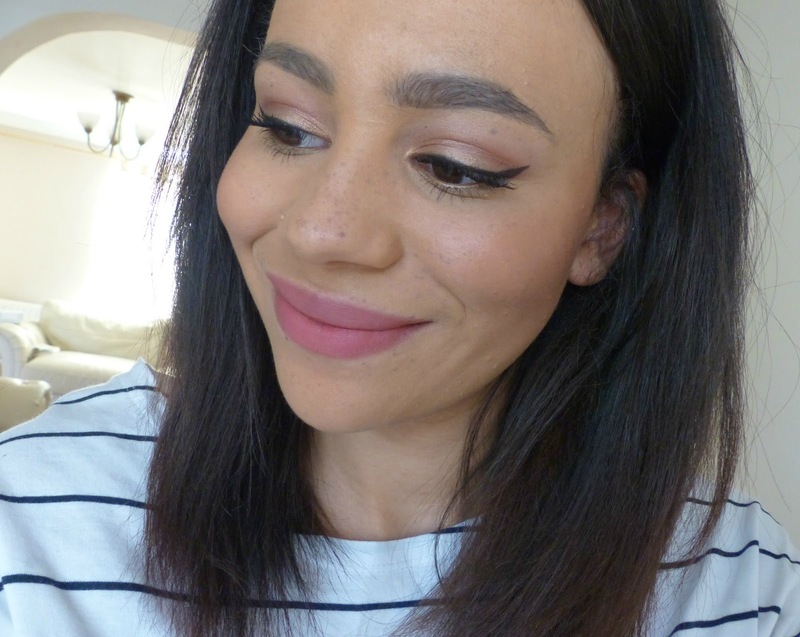 I love the pinky-rose shade as it's a little more colourful than your typical neutral lip but it's also really wearable. What do you think of my picks? Which products have you been loving this month? Oh man every time I see that Urban Decay Scorch eyeliner on your blog, it makes me want to go and order it right away! I contemplated purchasing the sigma brushes myself, but they seem a bit expensive over here! 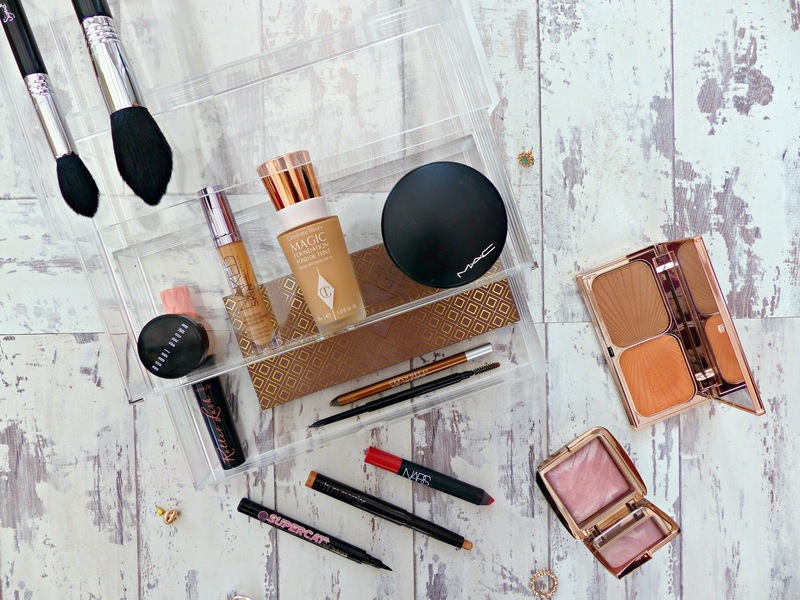 So many of the products you've mentioned are my all time favourites! Nice to hear that the CT foundation doesn't de-throne the Sheer Glow, I love SG so I'll just stick to using it. Such a pretty look! I'm dying to try the Magic Foundation! You are gorgeous Jasmine! The Charlotte Tilbury Magic Foundation sounds incredible! Such a gorgeous, natural look! I really ought to try the S&G liner! Freaking out that we're so into September, gah! You look so gorgeous in that picture, and I'm so jealous of how perfect you get your eyeliner! Great picks Jasmine, the finished look on you looks stunning! I've heard so many rave reviews about the CT Magic foundation for combo skin so I definitely need to look into this. I'm actually not too keen on the UD glide on eye pencils, I feel as though they glide just a bit too much and barely any colour shows up on my waterline. your picks are always on point!! I love how you switch up your make up every month! such a gorgeous look. That eye makeup looks fabulous. Eyeliner on fleek! That lip color looks so stunning on you! It's such a pretty shade. These are some great products! This kind of look is one of my faves for autumn! I think it just looks wonderful for a chilly day. Your skin looks really great! 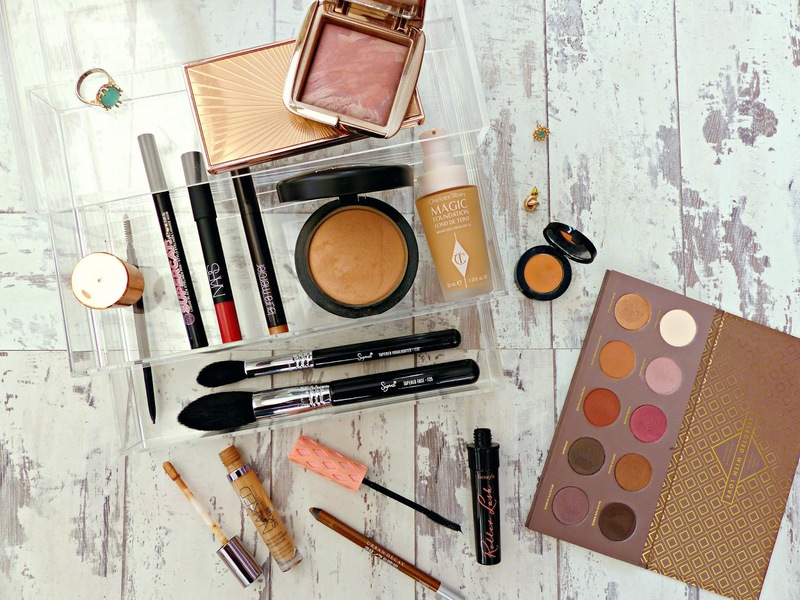 So many goodies - lovely post so much I want to try this month again! And you are mad gorgeous. I can't wait for my CT magic foundation sample to arrive! You are really tempting me to buy an Hourglass blush! Was never intrigued by them before but you've got me interested in them! I think that the Zoeva palette is calling my name. I love posts like this, probably because I'm nosy and want to know what products other people are using! It's interesting that you say the CT. Magic foundation hasn't dethroned NARS S.G, I know they're kinda similar so I'm wondering if I should pick it up when I finish SG or if I should just stick to the NARS alternative!